OGNL is Object Graph Navigation Language. 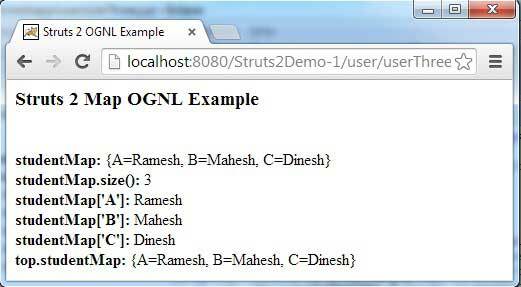 OGNL is an expression that can set and get the property of java object. 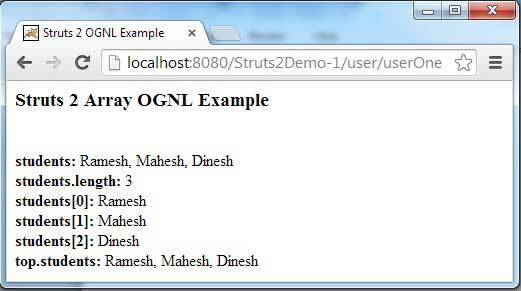 In struts 2 OGNL is used to associate Action class and UI components. OGNL uses a standard naming convention to evaluate the Expression. OGNL is the root object for the value stack. 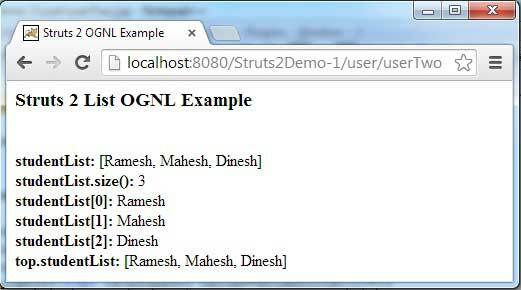 In Struts 2 value stack is a set of several objects but OGNL looks value stack as a single object. OGNL expression can set and get values from application, session, value stack, action, request, parameters, and attr. But in case of session or request we need to use # as below. And display results on UI components. We are providing complete example to run the demo. Find the eclipse structure of our example. Create an array in action class. Assign values in array. Create setter and getter methods for the defined property. In JSP we can fetch array values as below using OGNL expression. Use the link http://localhost:8080/Struts2Demo-1/user/userOne to see the output. To work with list, create a list property in action class. Assign some values to  the list and provide setter and getter methods. In JSP, list can be fetched in the same way as array using OGNL expression. Use the link http://localhost:8080/Struts2Demo-1/user/userTwo to see the output. In the same way we can access map using OGNL. Create a map and assign values in action class. And provide setter and getter methods. 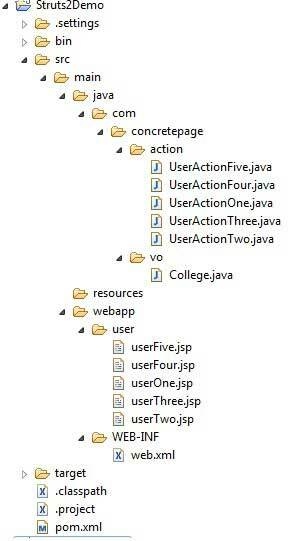 In JSP use OGNL expression to fetch map with the key as usually we do in java. Use link http://localhost:8080/Struts2Demo-1/user/userThree to see output. To use next level OGNL expression, we are introducing a user bean College where we define id and name. Use the college bean in action class and set some values. Define corresponding setter and getter method. In JSP use next level OGNL expression to evaluate the values. In this example we will deal with action class methods for OGNL expression to evaluate methods. Methods can be two types, one that will not accept any arguments and second one that accepts arguments. In the action class we have taken both type of methods. In JSP OGNL framework uses different approaches to fetch methods. Keep attention on JSP code how to fetch these two different methods. Use the link http://localhost:8080/Struts2Demo-1/user/userFive to check the output.